Recorded one night in Cozmoz, Sweden in 1996, this short EP is a solid testament to the raw power Anekdoten exude in the live setting. Four tunes are included: "Nucleus," "The Flow," "Karelia," and the new song "A Way of Life," which is only available (so far) on this special EP. The disc comes in a large oversized cardboard gatefold, with an LP-style sleeve and all. 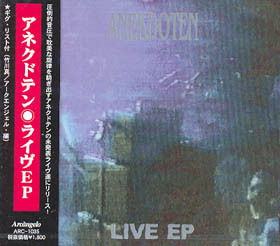 While the three known tunes are almost exactly like their studio counterparts, there is something magical which happens when Anekdoten takes the stage, and it's faithfully captured here. "A Way of Life" is much different, with lots of flute Mellotron loops, drums with brushes, and a repeating bass riff. Still very Crimson-oid, but a nice breather in the set which continues to build dynamically. The recording is perfect, clearly representing each instrument in the mix and the performance is 100% solid. In fact, because it's so consistent and condensed, this is probably the best Anekdoten yet. Hopefully the full live album, when released, will be every bit as good as this [see here - ed]. Hurry and pick it up while you have the chance, special edition EPs like this don't stay in print for long, and this one is well worth it.